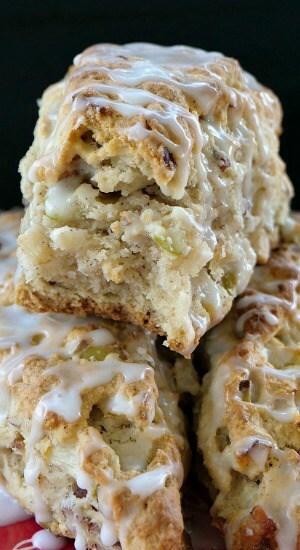 Fall is my favorite time of year to bake all sorts of apple recipes and these apple pecan scones are perfect this time of year. 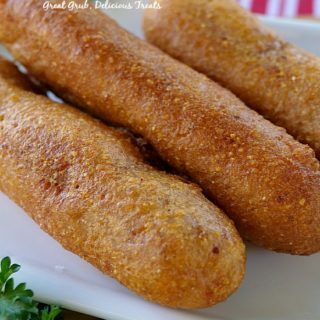 Actually, these can be made all year long but they are definitely a favorite during the fall season at our house. 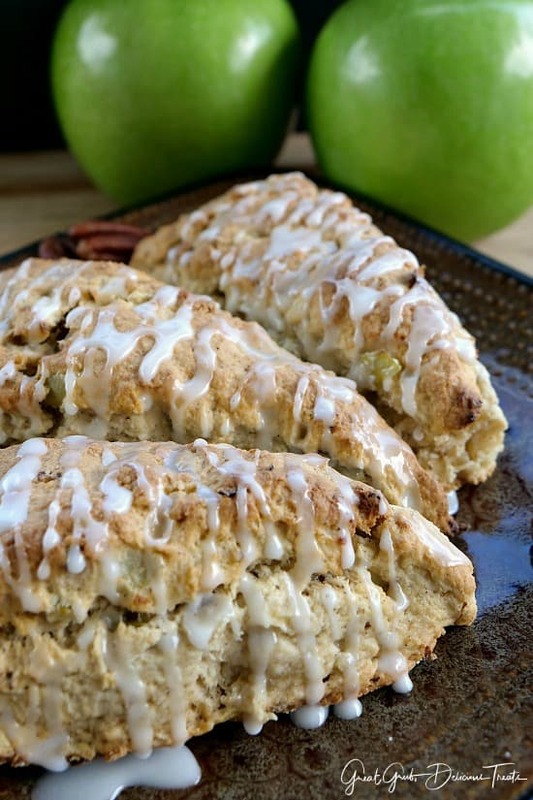 Flavorful and full of little apple chunks, these apple scones tastes great right out of the oven and then drizzled with a glaze for added sweetness. 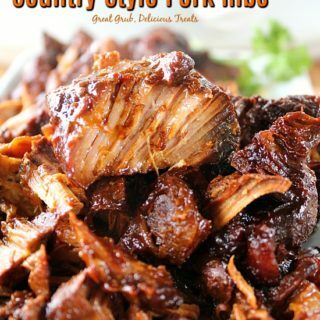 Super yummy, and with chopped pecans, just makes them that much more delicious. 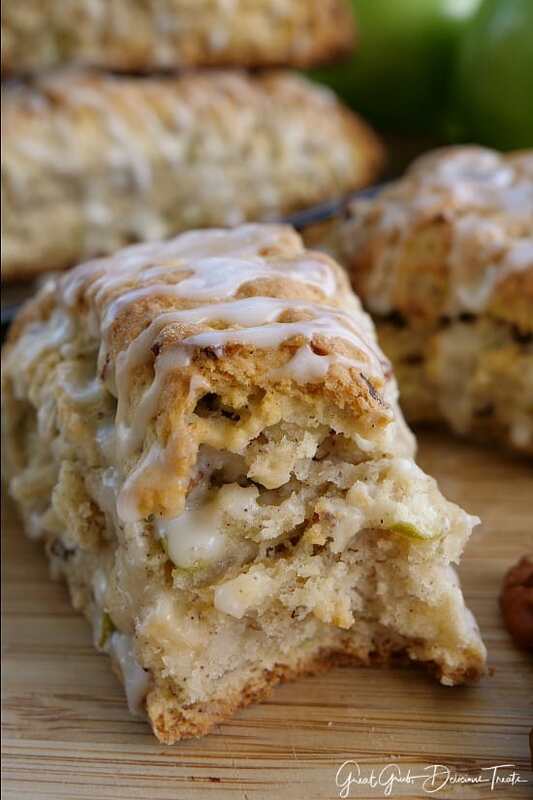 Crunchy on the outside, soft and delicious on the inside, these scones are to die for. 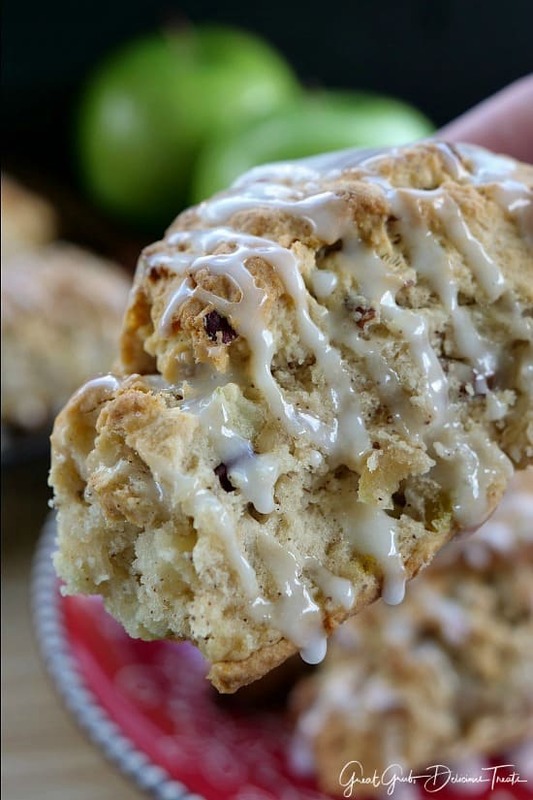 They are not too sweet and can easily be enjoyed without the added glaze. 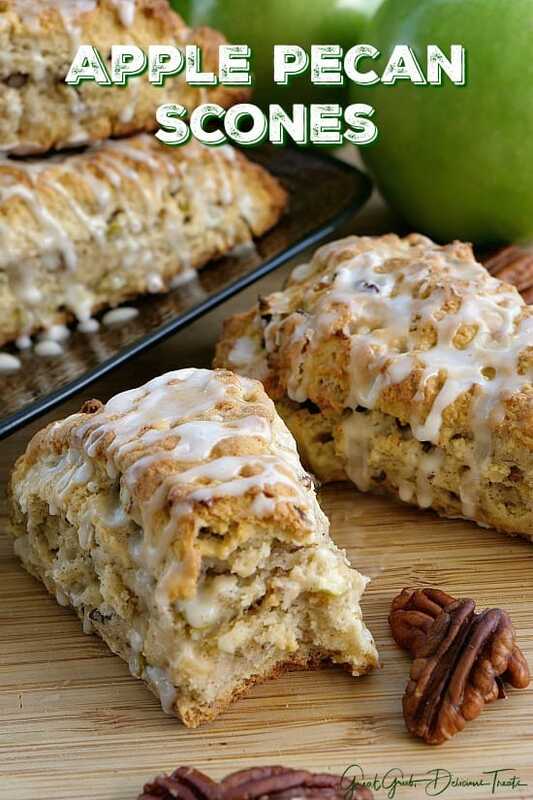 A super thin drizzle of glaze is all you need for these delicious apple pecan scones. 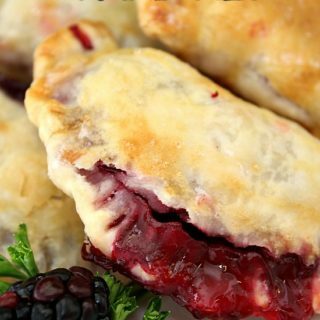 A simple mixture of powdered sugar and milk is all you need for the glaze. 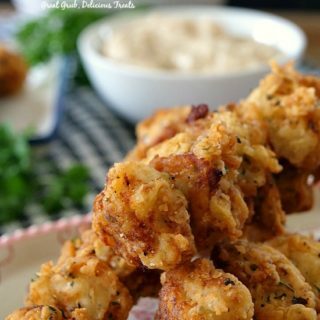 These are also great to make and then freeze. Grab one out of the freezer, pop it in your lunch. 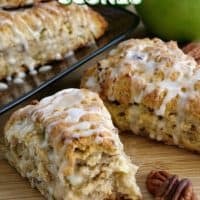 These scones make a delicious snack during the week, while at work or when needing a bit of sweetness in your day. 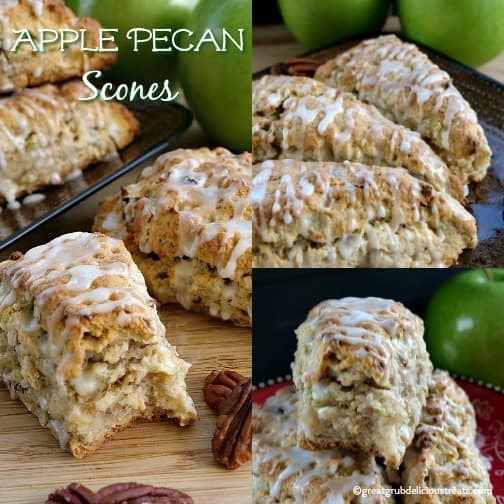 Start off by peeling and chopping an apple into small chunks and chopping the pecans. Using a large mixing bowl, whisk the flour, sugar, baking powder and baking soda and salt together. Add cold butter and with a pastry blender, mix until crumbly. Next, add chopped apples and pecans, stir. Pour in the milk, stir and then remove from bowl. Place mixture on a flour covered surface and knead about 8 times. Form into a rectangle, or a circle, and cut into 8 diagonal pieces and place on a baking sheet lined with parchment paper. Pop in the oven and bake for about 20 minutes or until browned. That’s it! 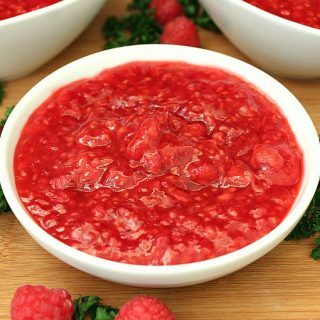 Then drizzle with glaze and enjoy. 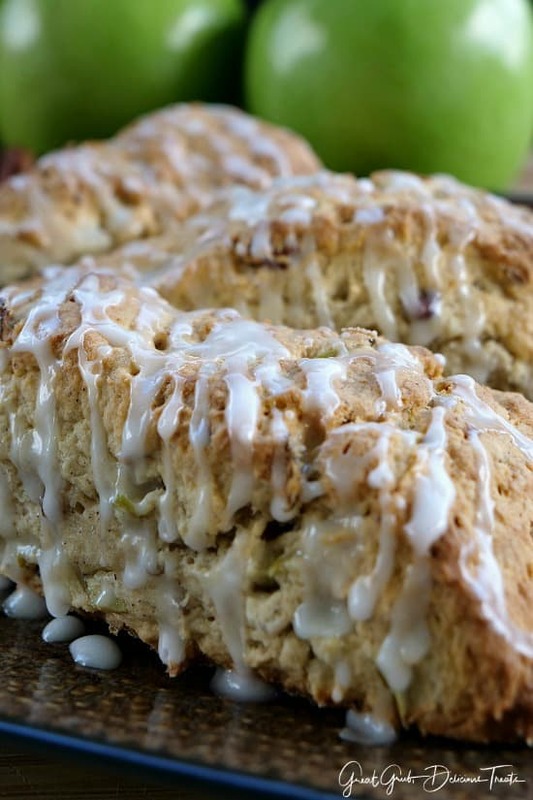 We hope you enjoy these apple scones as much as we do. 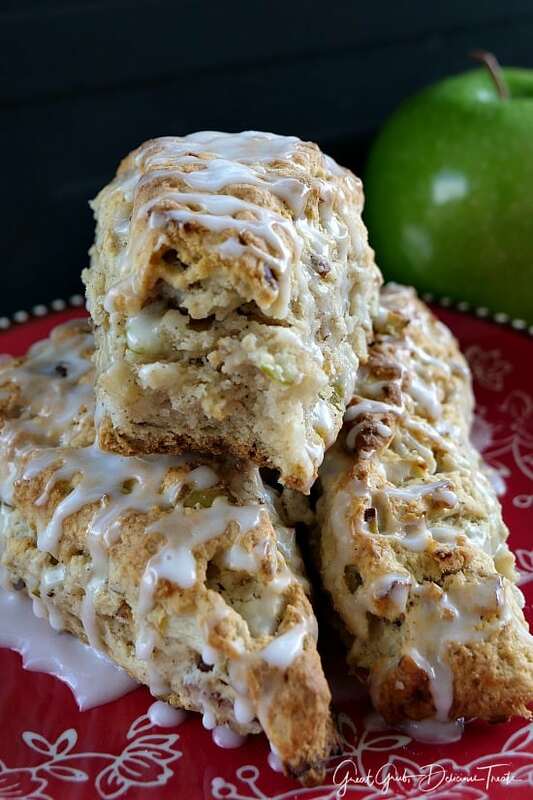 Here are a few more delicious apple recipes that can be found on the blog: Apple Pecan Monkey Bread, Apple Pear Walnut Crisp, Homemade Apple Pecan Cinnamon Rolls, Apple Pecan Cake with Caramel Glaze, Apple Stresuel Blondies, Apple Walnut Crepes, plus many more. In a large mixing bowl, whisk flour, sugar, baking powder, baking soda, salt together. Add cold butter into flour mixture and using a pastry blender or a fork, mix until crumbly. Pour in milk and stir until incorporated. Remove from bowl and place on a flour covered surface and knead about 8 times. 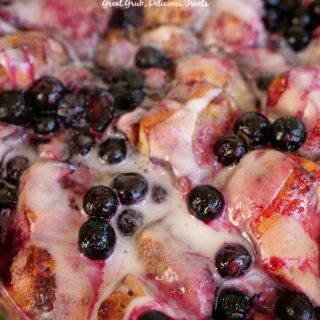 Form a rectangle, sprinkle with cinnamon and sugar, then cut into 8 diagonal pieces and place on baking sheet lined with parchment paper..
Place in the oven and cook for about 20 minutes or until browned. 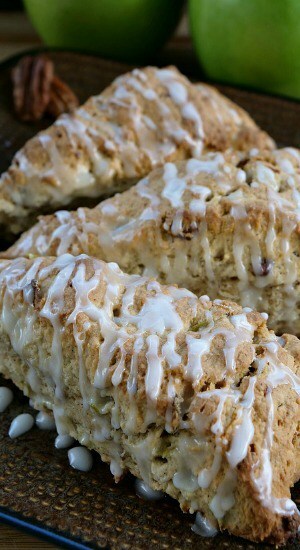 Mix powdered sugar with milk to make a glaze, then drizzle over each scone. They are best right when baked but I would say the a day or two before. Happy Thanksgiving! These were wonderful. I made some changes to suit my sweet tooth. I added a half cup of white chocolate chips. I also did not put the cinnamon sugar on the scones but in the mix. I also added some cinnamon into the icing drizzle.